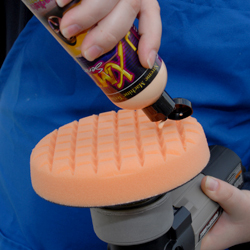 These foam buffing pads work as hard as you do to maintain the ultimate shine! Cobra Cross Groove Flex Foam™ 6.5 inch Buffing Pads maximize your detailing efforts to create shinier, smoother paint with less work! The Cross Groove design provides smoother, neater application of polishes and waxes to achieve flawless results on all types of paint. Eliminate splatter, reduce product waste, reduce heat build-up, and enjoy consistent performance with Cobra Cross Groove Flex Foam™ 6.5 inch Buffing Pads. With the innovative Cross Groove design, Cobra Cross Groove Flex Foam™ 6.5 inch Buffing Pads work hard to eliminate paint imperfections while maximizing gloss. The polishing pads’ groove design reduces surface tension, retains more product, minimizes heat buildup, and overall maximizes your polishing results. 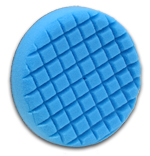 Cobra Cross Groove Flex Foam™ 6.5 inch Buffing Pads are precision made for use with a dual action polisher. The German foam compositions are each engineered to tackle specific paint imperfections using just the right balance of “cut” and finesse to remove imperfections and maximize gloss. The Cross Groove design channels excess polish into the grooves until it is needed on the work surface. Tough reticulated German foam – Not all foam is made equal. This imported German polyurethane foam holds up better to the rigors of polishing and swirl removal than typical domestic foam compositions. The dense, open cell foam resists tearing and minimizes the transfer of heat from the polisher to the paint. Breaks surface tension – One flat surface pressed against another flat surface produces a phenomenon known as surface tension. The cross groove pattern breaks this surface tension which allows the pad to glide easily over the paint without skipping. This smooth performance ensures uniform product coverage and minimizes the risk of holograms. Variegated “Flex Foam” surface – The Cross Groove Flex Foam™ design creates hills and valleys in the foam. 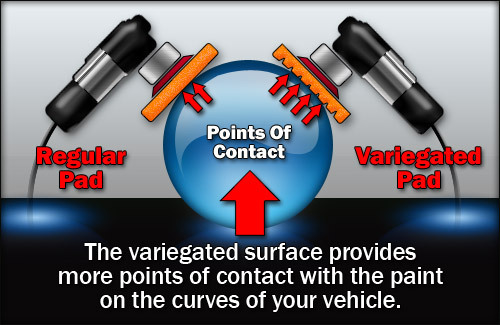 On the curves and contours of your vehicle, the “hills” provide more point of contact with the paint than a flat pad. Each of the peaks of foam adjusts individually to your vehicle’s surface to provide maximum surface contact on all body panels, not just the flat ones. The dense foam bends to conform to the curves of your vehicle. Reduces product waste – The foam pad’s grooves serve as reservoirs for excess polish. This benefits you in two ways: First, the grooves hold extra polish to prevent splatter. Second, the grooves minimize product waste by holding the excess polish until you need it. When more polish is needed, simply press lightly on the pad. Beveled Edge – Unlike perfectly flat pads, the Cobra Cross Groove Flex Foam™ Pads have a beveled edge that allows you to work the polisher at a slight angle if needed. For example, you can cut in close to mirrors using the polisher at a subtle tilt or you can carefully polish concave panels. * Attempt this only if you’re using a 5 inch backing plate. Minimizes heat build-up – The Cross Groove design allows air to flow through the pad as it orbits on the polisher. The grooves are cut from one side of the pad to the other, allowing heat to escape from underneath the pad. 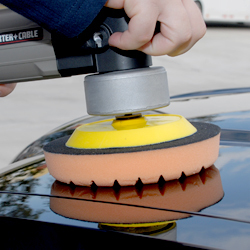 This self-cooling feature virtually eliminates the risk of burning the paint with the polisher. Reusable plastic storage bags – Each Cross Groove Foam Buffing Pad comes in its own reusable plastic storage bag. To keep foam pads clean and dry, we recommend storing the clean pads in these bags when not in use. The Cross Groove design allows air to flow through the pad, thereby reducing heat build-up. Cobra Cross Groove™ 6.5 Inch Flex Foam Buffing Pads should be used with a 5 inch Dual Action Hook & Loop Flexible Backing Plate to provide a margin of protection around the edge of the plate. If you tilt the polisher, the ¾ inch edge of foam will help buffer the paint against accidental contact with the backing plate. This white pad polishes the paint using pre-wax cleaners, cleaner waxes, and finishing polishes. This dense pad provides even product application and very light cleaning ability The white foam lightly polishes the paint without abrading clear coat or single stages. This gray pad is designed for applying glazes, waxes and sealants. The composition is firm enough to remove buffer swirls but soft enough to gently apply nonabrasive products on all types of paint. 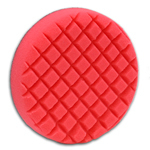 All Cobra Cross Groove Flex Foam™ 6.5 Inch Buffing Pads work with hook and loop backing plates. Hook and loop fasteners cover the backside of each pad from edge to edge to provide maximum surface contact with your backing plate. This firm hold will prevent the pad flying off or shifting during operation. We recommend using a 5 inch Flexible Backing Plate with the 6.5 inch pads. Cobra Cross Groove Flex Foam™ 6.5 Inch Buffing Pads give you performance, precision, and flexibility to tackle your toughest detailing challenges. 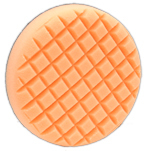 Compare them to standard flat polishing pads and see why the Cross Groove™ is simply better. 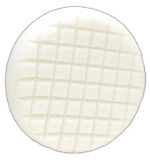 Pad Care: Wash foam pads in a mixture of Snappy Clean Pad Cleaning Concentrate and water. Soak the pads for up to 15 minutes and agitate with a Foam Conditioning Brush if needed. Rinse and lay flat to dry. Lay the pads foam down on a clean surface to allow water to drain away from the hook and loop adhesive. Store pads in their resealable plastic bags.